1. 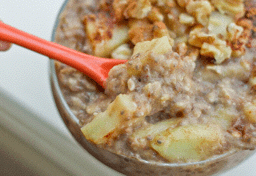 Bring the oats, water, milk, apple, and sugar to a boil in heavy saucepan. 2. Reduce heat to a simmer. Stir regularly until the oats are cooked (10-15 minutes). 3. Remove from heat and stir in ground chia and ﬂax seeds. 4. Spoon into bowls and serve with a splash of cold milk and a drizzle of maple syrup.